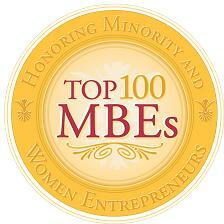 Dover, Delaware (October 6, 2009) – Catalyst Enterprises International is proud to announce that Dr. Michelle Brown, Founder and President of Catalyst Enterprises International, has been selected to receive the prestigious Top 100 Minority Business® Enterprise Award. In its fourth year, this program is designed to acknowledge and pay tribute to outstanding women and minority business owners in Maryland, Virginia, Delaware and the District of Columbia. The awards ceremony will take place at the Inn and Conference Center at University of Maryland University College in Adelphi, Maryland on Sunday, November 15, 2009. A panel of distinguished judges chose Catalyst Enterprises International from fourteen hundred nominations. Selection was based on entrepreneurs who demonstrated outstanding achievement in four key areas: entrepreneurship, client satisfaction, professional and community contributions. This year’s ceremony host organizations are: The Center for Business Inclusion and Diversity (CBID); the University of Maryland University College (UMUC); Southwest Airlines; Maryland’s Governor’s Office of Minority Affairs; greiBO media, and The Parren J. Mitchell Foundation for Talent and Education. Catalyst Enterprises International, a Dover-based organizational development firm is focused on helping organizations and individual turn potential into performance. Through customized development services corporations and not for profits organizations experience improved productivity, efficiency and employee morale. By assisting clients in crystallizing their vision, setting clear measurable goals, and effectively implementing their plan of action, clients are able to achieve more of their goals at an accelerated rate. Catalyst Enterprises specializes in executive coaching, strategic business development and process improvement. Please visit, www.catalystenterprise.com for more information about Catalyst Enterprises International. To obtain tickets for the 2009 Top 100 MBE ®Awards Ceremony or for a complete listing of this year’s winners, please visit www.top100mbe.com. Well done, Catalyst Enterprise International. Keep developing people and institutions. The sky should not limit you! Thumbs up, Dr. Michelle R. Brown.